Yorkshire second eleven have failed to progress to the semi finals of the 2015 Second Eleven Twenty20 competition. The second string won three and lost six of their twelve fixtures, with three others abandoned without a ball being bowled. At the time of writing, the county lie in sixth place in the northern table, three points below fifth, with the prospect of one or two counties still capable of relegating the team further down the table. Will Rhodes was arguably the pick of the Yorkshire contingent in their ill-fated campaign. Friday 8th of May: Lancashire Lightning versus YORKSHIRE VIKINGS; at Northorp Hall. YORKSHIRE VIKINGS won the toss. When play was halted by the weather, the Lancashire second XI needed to have scored at least forty-two runs to win, and they were three ahead of that 'target'. Lancashire Lightning won by nine wickets, via the Duckworth-Lewis method. Lancashire Lightning two points, YORKSHIRE VIKINGS no points. Friday 8th of May: Lancashire Lightning versus YORKSHIRE VIKINGS; at Northorp Hall. No toss took place. Match abandoned. Lancashire Lightning one point, YORKSHIRE VIKINGS one point. Tuesday 19th of May: Derbyshire Falcons versus YORKSHIRE; at Glossop. No toss took place. Match abandoned. Derbyshire Falcons one point, YORKSHIRE VIKINGS one point. Thursday 21st of May: YORKSHIRE VIKINGS versus Nottinghamshire Outlaws; at Harrogate. Nottinghamshire Outlaws won the toss. Ryan Gibson hit eight fours in his forty-six ball innings. 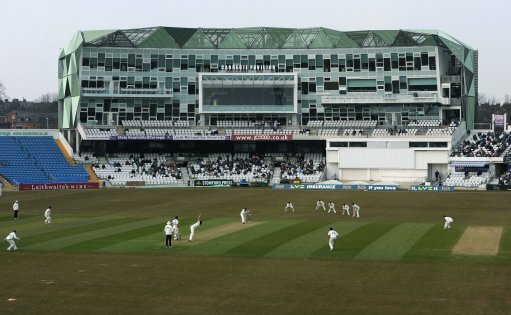 The only six of the Yorkshire innings came from Jonny Tattersall who weighed in with 25 runs. YORKSHIRE VIKINGS won by eight runs, via the Duckworth-Lewis method. YORKSHIRE VIKINGS two points, Nottinghamshire Outlaws no points. Will Rhodes managed one six and six fours in his 38-ball unbeaten innings. Unfortunately Ashraf and Carver conceded 65 runs from six overs between them. Nottinghamshire Outlaws won by six wickets. YORKSHIRE VIKINGS no points, Nottinghamshire Outlaws two points. Tuesday 26th of May: YORKSHIRE VIKINGS versus Durham Jets; at York. Durham Jets won the toss. Nineteen-year-old Brydon Carse bowled the only maiden of the match, but his team collapsed from 31 for one to sixty-two for six and failed to reach the target. YORKSHIRE VIKINGS won by nine runs. YORKSHIRE VIKINGS two points, Durham Jets no points. Tuesday 26th of May: YORKSHIRE VIKINGS versus Durham Jets; at York. YORKSHIRE VIKINGS won the toss. Ben Coad and Matthew Fisher each bowled the only maidens of the contest, but Matthew Waite undermined their efforts by conceding 24 runs from two overs. Durham Jets won by five wickets. YORKSHIRE VIKINGS no points, Durham Jets two points. Thursday 11th of June: YORKSHIRE VIKINGS versus Northamptonshire Steelbacks; at Barnsley. Northamptonshire Steelbacks won the toss. Ashraf and Carver conceded fifty-four runs from four overs between them. Pyrah hit three sixes and Gibson managed two, but the second eleven fell just short. Northamptonshire Steelbacks won by ten runs. YORKSHIRE VIKINGS no points, Northamptonshire Steelbacks two points. Ryan Gibson hit two more sixes, but his team narrowly succumbed in another high-scoring bonanza. Ashraf and Carver were too expensive again, as was Finch. Northamptonshire Steelbacks won by four runs. YORKSHIRE VIKINGS no points, Northamptonshire Steelbacks two points. Thursday 25th of June: Worcestershire Rapids versus YORKSHIRE VIKINGS; at Barnt Green. YORKSHIRE VIKINGS won the toss. Thompson and Rhodes hit two sixes each in Yorkshire's total. Then the hosts collapsed from 74 for three when the lethal Colin Munro was dismissed by Karl Carver. YORKSHIRE VIKINGS won by thirty-three runs. Worcestershire Rapids no points, YORKSHIRE VIKINGS two points. Thursday 25th of June: Worcestershire Rapids versus YORKSHIRE VIKINGS; at Barnt Green. Worcestershire Rapids won the toss. Matt Waites achieved three sixes, while Rhodes and Thompson hit one each in the forlorn run chase. Ashraf and Warner conceded fifty-four runs from four overs. Worcestershire Rapids won by fifteen runs. Worcestershire Rapids two points, YORKSHIRE VIKINGS no points.